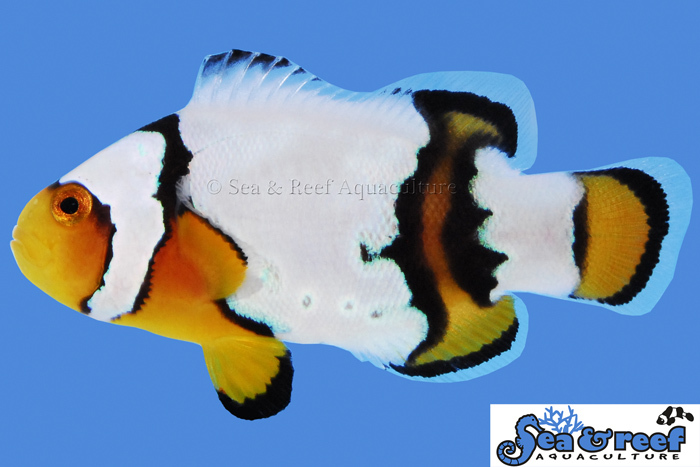 Snow Onyx Clownfish is a cross between a Snowflake Clownfish (A. ocellaris) and an Onyx Percula (A. percula). The Snow Onyx Clownfish is therefore a hybrid and has inherited great traits from both the Snowflake and the Onyx Clownfish. Like the Snowflake Clownfish each Snow Onyx Clownfish is unique with regards to their white markings. The Snow Onyx Clownfish has also inherited the black coloration and markings from the Onyx Clownfish, which show up between the white snowflake patterns. The black marking is faint in early juvenile Snow Onyx Clownfish, but as they grow the black markings become much more pronounced and develop great variations and patterns. Like fine wine Snow Onyx becomes even more beautiful as they age. The temperament and captive care requirements for Snow Onyx Clownfish are very similar to that of the Ocellaris clownfish. It is a relatively peaceful and hardy clownfish. They thrive in saltwater aquariums with or without an anemone present.